On the eve of our Yuriev Day, “Ethnosport" journal writes about the Drakoktonia (Δρακοκτονίας – Kill the Dragon), which took place in Greece on St. George's Day. The journal also informs about this custom as it is celebrate in Emmanouel Pappas village, a suburb of Sérres, a city in Central Macedonia, Greece. The holiday begins with a religious miracle-play, associated with the miraculous appearance of St. George, who lived nearby at the foot of the Kaguya hill, to protect the villagers from the Dragon. The Dragon barred the mountain stream with its huge tail, thus depriving residents of water and demanding a fee for using it. The fee was to be a young girl, brought to him as a gift every year. The lot once fell upon a princess, who was staying in those lands as a guest. When it was her turn to go to the Dragon, she turned to God in her prayer for salvation. At that very moment she heard the sound of hooves, and St. George presented himself on horseback. In one hand he had a cross, and in the other a spear, with which he stroke the Dragon dead like lightning. The princess was saved. In commemoration of this momentous event, the residents erected a temple on the site of the battle, and named it after their protector. 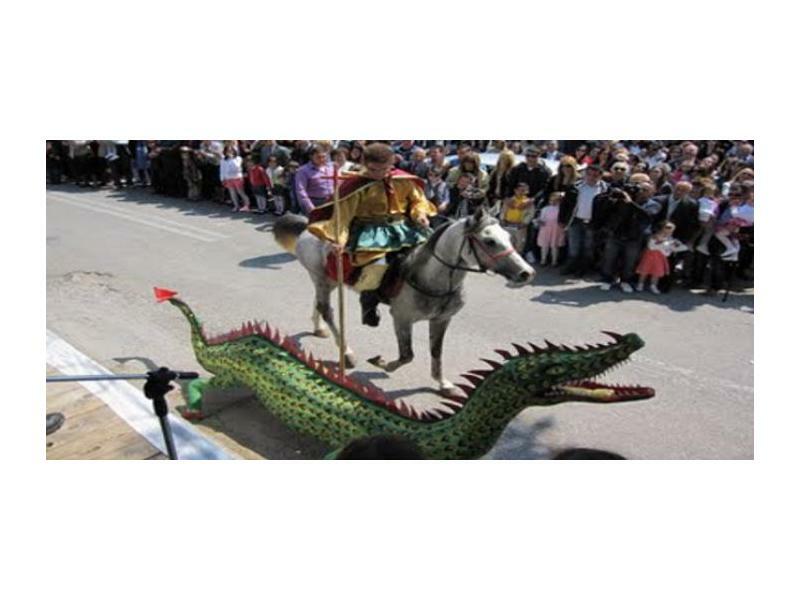 The day of deliverance from the Dragon is now revered as the patron saint’s day of the Emmanuel Pappas village, and is celebrated on St. George’s Day by a special ceremony. Two women, dressed in black, lead the princess to the place of sacrifice in front of the temple, where the Dragon is waiting for her. St. George appears on a white horse and slays the Dragon with a spear. Next, to celebrate the rescue of the princess, rejoicing with copious libations of wine begins while watching a tournament of traditional wrestling. The latter takes place in the afternoon in the same place, near the St. George church. However, it is done in the memory of another event, also related to his intercession. As legend has it, once, before the revolt against Turkish rule, the village boys competed against the Turks in traditional wrestling and won. It was regarded as a sign of future victory and the liberation of the Greek nation from foreign yoke. It is important to note that Emmanouel Pappas (1772–1821), the leader of the Greek revolution of 1821, was born in this village, and hence it is named after him. The Turks’ participation in the celebration of the patron saint's day is also quite understandable, since the vita of St. George was translated into Arabic as early as the beginning of the VIII century by Christian Arabs. It also served as the beginning of his veneration by Muslim Arabs. In the Arabic text of the apocryphal “Story of Prophets and Kings” of the X century, St. George is called a disciple of one of the apostles of the Prophet Isa, who was martyred, but then resurrected at Allah’s pleasure. During the time of John Kantakouzenos (1293–1383), a Byzantine emperor, in Cappadocia and Macedonia many mosques were built in honor of St. George. They survived until the XIX century, according to a Swiss historian Jacob Burckhardt (1818–1897). After the revolt of the Greeks, the village tournament became famous, and wrestlers from all over Greece gather there. Interestingly, the wrestlers are called pechlivanos (πεχλιβάνηδες), in a Persian manner. The only piece of clothing they are wearing is "kiouspeti" («κιουσπέτι» or «κισπέτι») – knee-length pants, made out of goat skins. Wrestlers accompany their appearance at "aloni" («αλώνι»), a specially prepared grass lawn near the temple, by characteristic loud banging of their palms on their knees. The combats are also accompanied by traditional music of zurna and drum. The tournament at times lasts until dusk, and the award for the winners is gathered by the village community throughout the whole year.